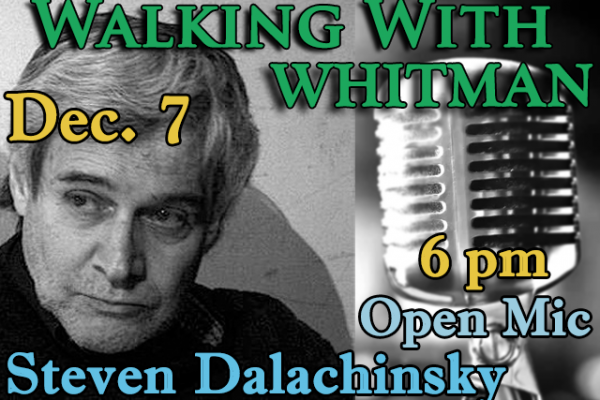 WWBA continues its eighth season of its signature series Walking with Whitman: Poetry in Performance. The event begins with a community mic at 6 pm, free with admission. After a musical prelude, the main event begins at 8 pm with the featured poet. Doors open at 5:30 pm. 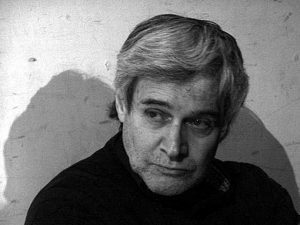 Steve Dalachinsky is a New York downtown poet who has been active in the free jazz scene for several decades. Dalachinsky’s books include Where Night and Day Become One: The French Poems (great weather for MEDIA, 2018), A Superintendent’s Eyes (2000), his PEN Award-winning book The Final Nite & Other Poems: Complete Notes From A Charles Gayle Notebook 1987-2006 (2006), Logos and Language, co-authored with pianist Matthew Shipp (2008), and Reaching Into The Unknown (2009), a collaboration with French photographer Jacques Bisceglia. He has published over 10 chapbooks, and his work has appeared in numerous journals, anthologies, and CD liner notes. His 1999 CD, Incomplete Directions (Knitting Factory Records), a collection of his poetry read in collaboration with various musicians, such as William Parker, Matthew Shipp, Daniel Carter, Sabir Mateen, Thurston Moore (SonicYouth) and Vernon Reid (Living Colour), has garnered much praise. Among Dalachinsky’s other CDs are Thin Air with guitarist Loren Mazzacane Connors (2006), Phenomena of Interference, a collaboration with pianist Matthew Shipp (2006), Merci Pour le Visite with Didier Lassere, drums and Sebastian Capezza, saxophone (2007). Dalachinsky’s main influences are the Beats, William Blake, The Odyssey, obsession, socio-political angst, human disappointment, music (especially jazz), and visual art with leanings toward abstraction. His work is largely spontaneous and leans towards transforming the image rather than merely describing it. Dalachinsky will also perform with bassist Michael Bisio during this event. Tickets can be bought at the door, or by calling 631-427-5240 x112. Tickets are available online.